The extreme close-up of Sludge’s face as the cover has long been an "iconic" sort of image for me, and yet another singular issue (albeit another #1, too!) with a single, memorable cover that is instantly recognizable and stands out. As the issue opens, we see things from the creature’s point of view–It’s in the sewer, watching a group of homeless, listening to a radio. On the radio, the host talks about a missing cop and the suspicious circumstances behind his disappearance. As the broadcast continues, our point of view shifts a couple times, to include the gang members that had something to do with the cop…as they head out and shoot more people. The creature hears the gunfire and gets involved. Despite their surprise at the creature, they seem to overcome it, preparing to leave it for dead before realizing it’s not so easily killed! We get internal dialogue from the creature–who struggles to recall the proper words, and its frustration grows the more this happens…and the frustration’s taken out on the gang members. The creature also seems to have the ability to melt/mold flesh–grabbing one kid’s face, and "melting" it to a blob of skin, with no way to inhale or exhale…a gruesome way to die, but perhaps deservedly for the innocents killed shortly before. We move into a flashback and see that this creature IS the missing cop, who wasn’t exactly squeaky-clean…but drew a line at killing people. For this, he himself is shot up–certain overkill–and the still-living body dumped in a sewer, where it contacts some sort of chemical, and mutates the body into a walking pile of–you guessed it–SLUDGE. Back in the present, police find the gang members’ bodies and speculate what could have killed them–while back in the sewer, the creature finds and crushes the radio, stating that he can’t stand the host. As he leaves, a couple of the homeless comment on the creature being a walking sludge heap–or "Santy Claus." This issue’s story is pretty familiar to me, compared to some of the other Ultraverse books. I definitely remember getting AND reading this when it came out. I don’t remember any further issues, but I clearly recall the creature’s stumbling over words and his frustration at that. The story is rather formulaic, and the creature reminds me very much of the very-little I know about Marvel‘s Man-Thing (itself with a significant run by Gerber! ), and by comparison there to DC‘s Swamp Thing. In some ways, this seems like it could be a darker take on a Ninja Turtles character–someone injured, dumped into a sewer, where they contact a strange chemical and mutate into some creature and then take on a new mission to fight crime/do good/whatever. I think that familiarity of elements kept the character from seeming as gruesome to me as a kid, and I don’t remember being bothered by him killing people…I probably just didn’t think much on that at the time. The art’s pretty good, and I like it. The creature looks like a "creature" made of sludge, and the people look like people. The story is easy to follow visually, and the visuals do a good job conveying everything as expected. The page layouts vary quite a bit, and work well conveying mood and tone. While a couple pages are primarily a single image/panel, others have a lot crammed into them, making for a good mix that does NOT feel like there’s any "cheating" going on. One panel/page showing the creature smashing a car while yelling "Pull over!" stands out to me in particular–and I hear the "Get over here!" voice from the Scorpion character in the original Mortal Kombat video game. Sludge is the actual series and main content of this issue; but it has a "flipbook" segment where you literally "flip" the book over to see a different cover and read some content from that direction–it appears upside down and out of order if you continue linearly from the front/main Sludge cover. 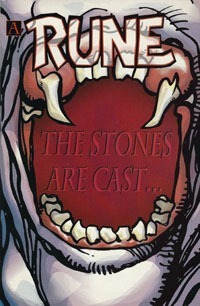 The flip-cover to Sludge #1 features a closeup of an open vampire-mouth, with a translucent Rune logo, the letter "A" indicating this as the first chapter, and the text "The Stones are cast…"
We get a title page with the Rune logo, and the story title, creator credits, and an outline of the Rune creature, as well as an explanation that each of the 11 October titles contain a chapter of Rune, and that 9 of the 11 flip covers combine to form one large poster image–and we get a white background/black silhouette showing that. The next page tells us a bit about Rune, with a Barry Windsor-Smith image of the creature. As the story itself begins, we see bloody hands with long nails casting multi-colored gems toward a floor. Moving to the second and third pages, we see the creature contemplating the gems–with markings (runes) on them, and determines that there is a power that will restore him…Rune shall live! It’s hard to really talk much about only 3 pages, especially just the first three pages of a story. We have text telling us about the creature, and now we see the creature…but there’s just not much STORY to the pages. It reads much better as part of a larger whole…but on its own, this seems rather negligible. Visually, this is distinctively BWS art…perhaps distinctive because I recall this story, but also the similarity in visual style to the likes of Marvel‘s Weapon X and classic ’90s Valiant/X-O Manowar stuff I’m familiar with. It’s definitely unique enough to set this off as its own thing, and make Rune visually distinctive. This is clearly the character previously advertised. This feels more like an "ad" than much else–and given the Night Man "preview" has a full text page AND 3 story pages out of context, it sorta negates the specialness to this premiere of Rune. Especially as I’m reading this issue in 2018, the $2.50 cover price doesn’t phase me when virtually every comic out there is now $3.99, with only a few minor exceptions at $2.99. The issue itself–Sludge–has 25 numbered story pages. 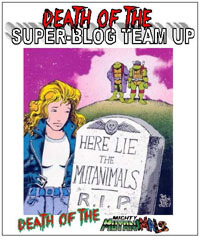 The cover claims this is a 40-page special…so we fall some 15 pages short of that! But add in 3 story-pages of Rune, and the two pages introducing those story pages and we’re up to 30. Further factor the Night Man preview (if that’s content) and we’re up to 34; a Mighty Magnor 1-page piece takes us to 35; the Rune #0 coupon stuff nudges us to 39 pages…so it’s iffy. But in 2018 and this being essentially a definite 25-cent book, max of $1ish…it’s more than worth that sort of price, whether 20 pages or the stated 40. And the 40 probably counts the main ads and such, so…it’s accurate. It doesn’t say 40 story pages, after all. The Rune portion feels like little more than an ad–as said above, there’s a Night Man preview that has just as many "story pages" with about as much (if not MORE) context…so this could just as easily been a Night Man flip book with a several-page Rune "preview" and been functionally the same content between the covers. Still, this having been designated "Rune Month" (I believe that was the thing back in the day, as it’s stuck with me all these years somehow) it at least makes for a "theme" that is carried across all the books, unifying them. And rather than just the same 3 pages over and over again in all 11 books, each has 3 unique pages that combined make up a prologue issue ahead of an ongoing series in a way that I doubt we’d see in 2018 from any major publisher. As with other Ultraverse #1 issues, this is certainly worthwhile in itself as a single issue to check things out. I’ve seen this and many of these other early Ultra-titles in 25-cent and 50-cent bins, so I wouldn’t suggest paying more than $1 or so if you can help it. If you like Steve Gerber’s work, you’ll probably like this; if you like Lopresti‘s art, same deal. And though there are the comparisons to make to other publishers’ characters, this is a unique character so far for the Ultraverse itself, and worth checking out just because. This stands alone pretty well–and remains (thus far) the only issue of the series I know I’ve actually read, so there’s that as well.